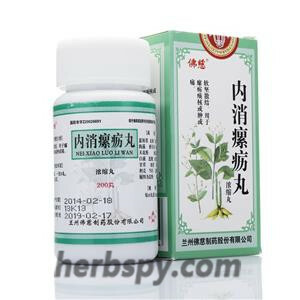 For scrofula swollen or sore.Mainly used for the treatment of chronic lymphadenitis, lymphatic tuberculosis, breast hyperplasia, benign breast mass and so on. Softening hardness to dissipate stagnation. Common Selfheal Fruit-Spike,Figwort Root,Seaweed,Tthunberg Fritillary Bulb,Clam Shell,Prepared Chinese rhubarb,Compound of glauber-salt and liquorice,Chinese Angelica Root,Rehmannia Root ，Platycodon Root,Bitter Orange,Snakegourd Root,Peppermint,Halite,Japanese Ampelopsis Root,Weeping Forsythia Capsule.Excipients for the starch, honey. This product is brown to tan concentrated pill;slightly fragrant, tastes salty and bitter. For oral use after meals,8 pills thrice daily or by medical ordor. Loose stool patients with caution. Seal in cool and dry place.